Bring your idea to market faster with the SharkCAD products: SharkCAD and SharkCAD Pro. SharkCAD is the new standard with precision 3D digital prototyping. Explore new product concepts with unprecedented ease and precisely share data with manufacturing processes. SharkCAD Pro is equiped with a full mathematical constraint engine, photorealistic rendering and animations. But if you don't need advanced modeling tools and parametric constraints, try SharkCAD. 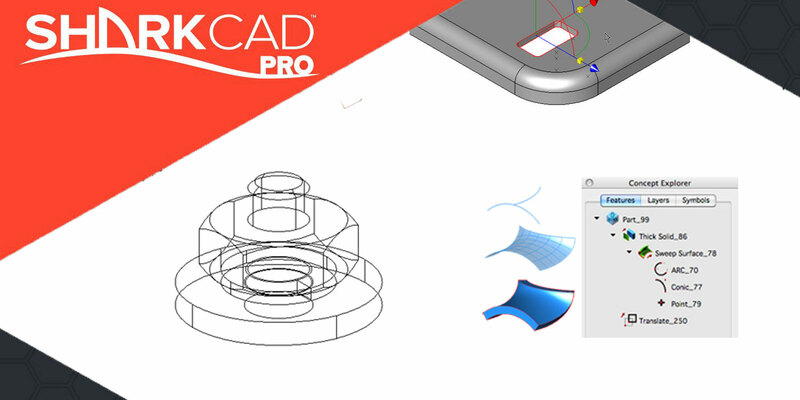 SharkCAD (Pro) is equipped with a complete collection of tools for advanced 2D & 3D modeling. You can draw with mathematically described geometry (NURBS) and you can use curves, surfaces and solids along and interwoven with each other. In addition, thanks to the automatic 2D drawings you will have your construction documents directly at hand with one click! SharkCAD (Pro) is a very intuitive design package. It keeps the design history in a tree structure, so that you can easily find previously made changes. You can also refer to external files with the retention of the link. So if you change something in the source file, you can update this in your design directly! SharkCAD (Pro) includes 3D printing tools to prepare and validate designs to make them 3D printer ready. The printing tools will check for common errors that will save you time and money. SharkCAD is equipped with the following functionalities to offer you versatile 3D modeling. 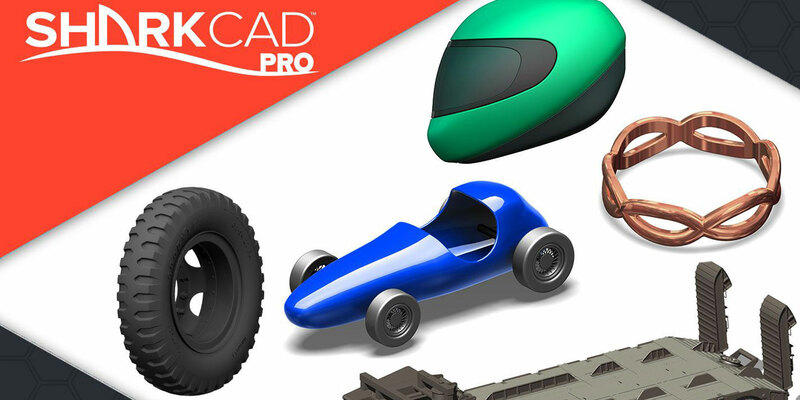 SharkCAD Pro contains a complete collection of tools for 2D & 3D modelling. 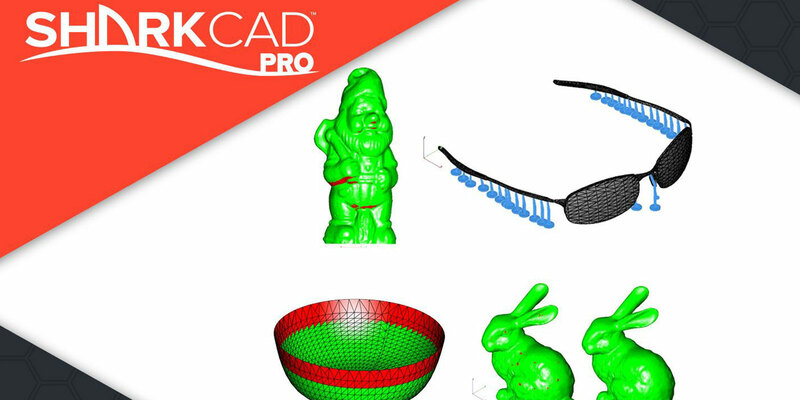 From simple designs to extremely twisted models and from thin-walled products to molds: you can all design it in SharkCAD (Pro)! And with the all new SubD NURBS tools you will have more freedom of form than ever before. SharkCAD includes 3D printing tools to prepare and validate designs to make them 3D printer ready. The printing tools will check for common errors that will save you time and money. 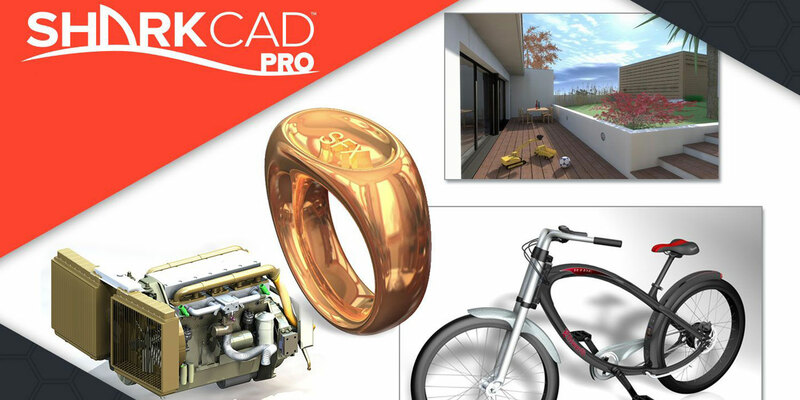 SharkCAD includes photorealistic rendering to add visual realism to your designs. Drag and drop materials, textures, and decals onto parts. Add lights, backgrounds, foregrounds or environment maps to further enhance the scene. For output, SharkCAD provides options to generate high quality poster size images. SharkCAD registrates your design history very accurately in a 'tree model'. This allows you to easily find previously made changes and, where appropriate, make a quick change to it. SharkCAD contains a lot of import and export possibilities, so it can cooperate with almost every 2D and 3D software package on the market. In SharkCAD, you can edit the tool palettes and create your own ones! Very useful if you use some tools very often and want to have them by hand quickly. It can save you a lot of time! An intuitive graphical widget that attaches to your objects allowing you to dynamically move, rotate, and scale objects in 2D or 3D. You can use the gripper to drag and drop copies and to stretch or modify geometry. Because SharkCAD uses XRefs, you can refer to external files. For example: if you have changed something in the source file, you can make it up-to-date in your design! With SharkCAD you will draw with real NURBS, a mathemical geometry. NURBS can describe every shape (from a 2D surface to a 3D double-curved surface) very accurately. With this flexibility and accuracy, you can use it in almost every stage of your design (from illustration to working drawing). With SharkCAD you can draw curves, surfaces and solids. Not only side by side, but also with each other and through each other! For example: you can subtract a solid from a double-curved surface or accumalate it to it. In this way you will have a lot of freedom of form! SharkCAD automatically generates 2D drawing from your model. Your 3D design will be turned into a 2D working drawing with one mouse click! An intuitive way to interact with planar objects and faces of solids. 3D solid model editing provides drag and drop ease to changing surfaces. Draft floor plans easily with auto-trimming walls. Custom walls allow composite walls to be created showing layers of building materials. Make the walls in your plan 3d with a mouse click. Add parametric doors and windows. SharkCAD comes with standard woodworking joints. You can create rabbet, dado, miters, dovetails, and tongue/groove automatically. SharkCAD allows you to snap points parallel to an exisiting line, snap one cylindrical face to another and face snapping will aid in aligning one body to another. You create and edit a mesh model and SharkCAD Pro converts it into a 100% smooth surfaced model, suitable for further editing using solid modelling operations such as blending, chamfering, and shelling as well and exporting to NURBS supported file formats like IGES, SAT and STEP. With SharkCAD Pro you can also model extremely. You can twist, bend and stretch your designs. Because SharkCAD Pro works with parametric constraints, switching between concepts becomes a piece of cake. You can change something in your geometry quickly, without having to change your complete design. It will save you a lot of time! With SharkCAD Pro you can add lips and grooves to create tightly fitting shells and by adding ribs to your design, the strength will be guaranteed. Inspects a part for its print viability, displaying warnings or errors to the user. Facet normals define the inside and outside areas of a part. If facet normals are pointing the wrong way, the 3D printer will not create the part correctly. Visually inspects model for areas that may require structural support for 3D printing. Visually inspects model for areas that may be too thin for 3D printing. This user interface slices models to a given direction and thickness. The dialog box allows for animation through the slices and single stepping. Also, verify a part has closed, non-overlapping sections, a requirement for 3D printing. The Save Slices option provides several options to save slices to DXF, STL or add the results directly into your design. The Auto Position tool translates the model to the positive x, y coordinate system at z = 0. Manually adds geometry to support material as it is created by the 3D printer. Support structures controls include Attach Radius, Midpoint Radius, Base Radius, Base Thickness and Drag base and mid points to modify structure location. Toggles the boundary of the default 3D Printer. The volume is defined within the Printer Definitions dialog box. Sets key parameters of the 3D printer, including length, width and height of the volume accessible. The parameters in the Printer Definitions dialog box are used for 3D Print Check, Auto Position and other commands. With SharkCAD you can present your design in very different ways. A photorealistic image is one of them. You can generate it in every size you like, even poster size! SharkCAD automatically calculates all shadows, reflections and refractions of the objects and materials. SharkCAD contains a very extensive material library. By dragging and dropping you can apply the material to your design! You will have access to materials like metal, glass, wood, stone and plastic. Besides photorealistic rendering, you can also present your design as a concept. For presenting your first concept, you can use for example the sketch, cartoon or aquarel style in SharkCAD. For creating even more realistic images, you can use HDRI images. With a HDRI image you can grab lighting and environment data from a picture. Those variables can be displayed in, for example, chrome or a glossy surface. In this way you can create an even more realistic setting! Texts and dimensions can be rendered alongside the design. In this way you will have a visual presentation as well as a technical presentation! Object based animations: put your model and the objects in it into motion and show how your design works. Fly-arounds with the camera: show how your model like from different sides. QuickTime VR's: let people watch your model from the inside and outside on their own by using the QuickTime player. For students, we offer licenses against attractive prices. When using the student version, you are able to use the full functionality of the program. The only limitation is that you can't open the files in a commercial version of SharkCAD Pro. .
Student licenses can be ordered through our webshop. Please don't forget to upload or e-mail a copy of your student card. Shark FX 9 introduces SubDivision Modeling, a new and powerful way to design. You create and edit a mesh model and Shark FX converts it into a 100% smooth surfaced model. FX can turn these surfaces into a real solid model, suitable for further editing using solid modeling operations such as blending, chamfering, and shelling as well and exporting to NURBS supported file formats like IGES, SAT and STEP. As said, the latter is FX only. This build includes a new main palette that includes tools for creating quad mesh primitives that can later be subdivided and smoothed. Use a path to guide a profile that you add to a solid. Traditionally this would be two operations: first a sweep and then a boolean add. Use a path to guide a profile that you remove from a solid. Traditionally this would be two operations: first a sweep and then a boolean subtract. Linear Duplicate was updated to support a height value for the duplicates, making it easy to create shapes like stairs. Polar Duplicate was updated to support a height value for the duplicates, making it easy to create shapes like stair cases. The Union, Subtract, and Intersection solid tools now have an option to add either radial or chamfers to new edges introduced after a Boolean operation. Shark’s infrastructure was significantly updated to support a 64 bit architecture providing the ability to load larger parts plus improve memory performance when handling large models. Mac users we have some very good news for you! The old Carbon framework used to interface to the Mac OS has been replaced with Cocoa and CoreGraphics. This makes Shark FX much more robust and faster on the Mac platform. If you are on a Mac or want to switch to Mac now is the time to start working with Shark FX version 9! Elements not supported by OpenGL are now drawn faster to the screen. Updated core kernel technology from Dassault Spatial partner. Printing now has improved accuracy in 2D, it supports Previewing and it is now possible to print 3D objects in rendered views. Standard woodworking joints have been added. You can now create rabbet, dado, miters, dovetails, and tongue/groove automatically. The Shark family of products provides an extensive set of interoperability solutions for industry standard data sharing through IGES, STEP, SAT, OBJ, SketchUp®, AutoCAD® 2014 DXF/DWG, Adobe Illustrator®, Rhinoceros®, STL, and 3DS Max® data formats. Additionally, Shark provides the ability to natively read Pro/Engineer® and CATIA® V4 / V5 parts and assemblies. No Windows? You might consider using Parallels or Bootcamp to use Windows on your Mac. Align faces quickly and easy. Snap one cylindrical face to another. Insert 3D doors and windows. Video's, tutorials and more. Everything you need to get you started with SharkCAD. A selection of SharkCAD video tutorials to get you started. Would you like more information about SharkCAD?